These days, Antarctica is the coldest, driest place on Earth. What little life it harbors clings to the edges of the continent. But that wasn't always true. 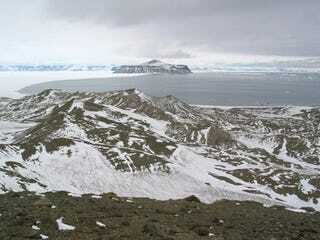 45 million years ago, Antarctica was a lush rain forest, teeming with life. Although we tend to associate the term with hot, sandy places like the Sahara, the world's biggest desert is actually Antarctica. The coastline only receives about 8 inches of precipitation each year, and it's even less than that further inland. The McMurdo Dry Valleys, in fact, have not received any precipitation in millions of years, thanks to incredibly strong katabatic winds that evaporate any incoming water or snow. It's hard to imagine life ever thriving on this harsh, unforgiving continent, but the new discovery of ancient turtle bones dated to about 45 million years ago serve as a reminder that Antarctica was once a very different place. Found on nearby Seymour Island, the bones are a couple fragments from either one or two turtles' shells, and they belong to a species that was previously unknown in this region. That suggests greater turtle diversity than was previously known, which in turn indicates Antarctica was even warmer than previously thought. That's because diversity is, generally speaking, directly related to the temperature of the water, with lots of diversity in tropical waters and relatively low diversity in more frigid waters. In the Eocene Epoch, which lasted from about 56 to 34 million years ago, Antarctica was still connected to New Guinea and Australia, forming the last vestiges of the southern supercontinent Gondwanaland. The fact that Antarctica was connected by land to these other large regions helped isolate it from colder ocean currents, which allowed the continent to support a tropical rainforest. At that time, Antarctica was home to lots of tropical and subtropical animals, including turtles and even marsupials, which have also been discovered on Seymour Island. About 23 million years ago, Antarctica became completely isolated from other landmasses, which hastened the spread of ice across the continent and ultimately killed off all but the hardiest lifeforms, such as penguins and microbes, which still manage to eke out a cold existence on the antarctic shoreline. Even then, it took a while for the last of the old way of life to be completely extinguished. As recently at 3 million years ago, a huge temperate forest thrived just 400 miles from the South Pole. Antarctica is now covered in a massive, permanent layer of ice, and it's unlikely that Antarctica will ever again thrive like it once did, at least not without millions more years of slow geological change. So for now it's left to little artifacts like these shell fragments to serve as reminders of what Antarctica once was. And, if nothing else, it's all proof that, against all odds, the Savage Land isn't completely ridiculous.